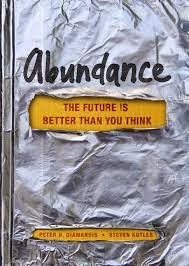 Abundance: The Future Is Better Than You Think by X Prize founder and Singularity University co-founder Peter Diamandis and author and entrepreneur Steven Kotler was a solid read about actions around earth's available resources. The book early on contains the statement "technology can make the once scarce now abundant" and Diamandis and Kotler write throughout the book about exponential technologies, with the solving of one problem then serving as a multiplier and having positive downstream impacts in other areas. Covered as the probably the most important basic need is that of access to clean water. If this can be solved, people’s health can improve, hunger be reduced and time freed up to do other productive things. The authors note how we need entirely new approaches to water, not simple conservation and some of the innovations both here now and potentially to come are inventor Dean Kamen’s company DEKA Research in New Hampshire and its Slingshot that generates clean water from anything wet, no matter how dirty, a smart grid to allocate water usage and smart toilets that can generate freshwater, fertilizer and power. In relation to food supply, it’s noted that we spend too much money and energy moving food, and the solution is to "move the farm" and do vertical indoor farming through hydroponics. Additionally, fish farming, genetically engineered seeds and in-vitro meat grown from stem cells (as meat from animals can both be a source of disease and requires roughly 2,500 gallons of water per pound) are all written about as things that can bring about abundance in relation to food, with the science of designing food systems that mimic the natural world being known as agroecology. Diamandis and Kotler cover how some of the areas of improvement in energy availability are solar power, biofuels, like those being worked on by Craig Venter and his company Synthetic Genomics Inc., and nuclear power. Also covered is both a local level smart energy grid that can store energy during the day and then release it at night and a large scale energy grid for widespread distribution of power based on demand. Robotics was additionally noted as an enabler of abundance, with mention of the company Willow Garage in Menlo Park and Intuitive Surgical in the Bay Area that makes the da Vinci system surgical robot. Also in relation to health was stem cell treatments and growing artificial organs out of cells using 3-D printers, which are a fascinating innovation even if not using cells to build stuff. In terms of information and education, Diamandis and Kotler mentioned the internet's ability to disseminate information quickly as a key enabler of abundance and in the future, the potential benefit of the Internet of Things, basically devices in the home that all have unique IP addresses, along with education advances and personalized learning like through the Khan Academy and game learning. Also noted was the new philanthropists, those like Jeff Skoll, Pierre Omidyar, Warren Buffett, and Bill & Melinda Gates putting huge sums of money towards fixing difficult problems and one interesting thing in the book was the distinction between the top and bottom of the pyramid in terms of people globally and their standards of living, and how large improvements may well come from the bottom. These individuals collectively have great spending power, huge needs and likely more than wealthier people in developed countries would benefit from force multipliers, like when someone get a basic need like clean water, it frees up time to be productive in other areas. All in all, it was a very interesting book and makes the case well that prospects for the future not as bad as they sometimes seem.